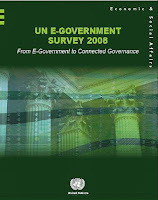 The United Nations has published five reports on e-government. There is an overall "E-Government Readiness" index that factors in the e-government web measure, infrastructure and human capital. The web measure index is the pure e-government index. There are now four years of web measure indexes available (2003, 2004, 2005, 2007); the 2001 values are not included because a different methodology was used.